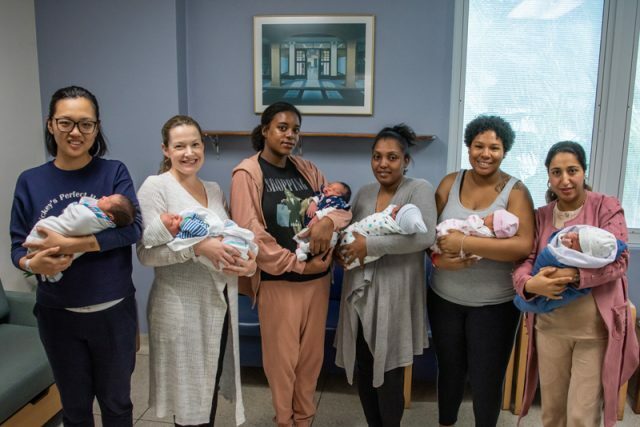 Six of the seven mothers with their newborns: Pictured from left: Yuedi and Jackson, Kristen and Hayes, Gina and Glow, Vanessa and son, Brittany and Maci & Ouafae and Ryan. It was an unusually busy time at Bermuda’s hospital earlier this week, but all for a good reason – as seven babies were born in only 24 hours! “It was a brisk day in the labour and delivery rooms as seven babies were born within 24 hours,” says Lisa Blyden, clinical manager of Maternity and Special Care Baby Unit. Seven babies born in a single day is not a Bermuda Hospitals Board record. The last time this happened was on 18 October 2017. There have been 14 times in recent history that eight births have been recorded in a single day, nine has been the maximum. Interestingly three of the four times that this took place were in 2009. It also took place in 2002.